Just as with casting on, there are several methods for casting off, or binding, your knitting. Which method you use depends on the type of project you are knitting. 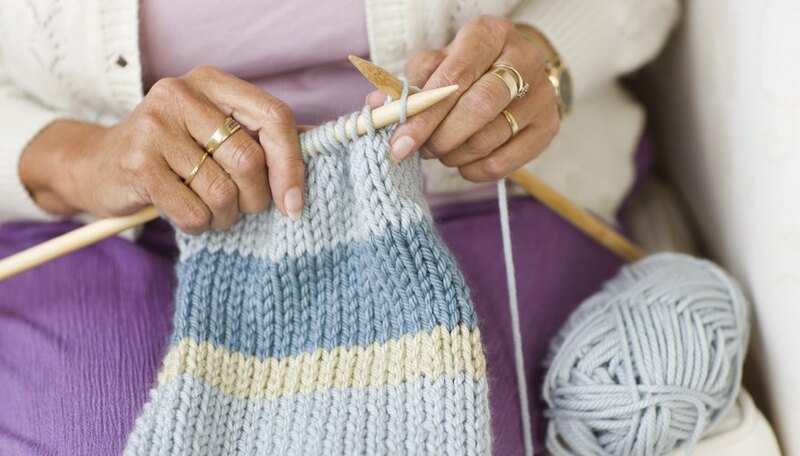 The basic knit or purl cast off generally produces a more tightly knit row than regular knitting. For items where you want a bit more stretch or you need to preserve the shape of the final row, there are alternative methods. This method is fine for the average item and is called for in most patterns. Simply knit the first two stitches as a normal row, then pull the first one over the second, leaving just one stitch on the right need. Knit another stitch, pull it over and continue across the row. The knit cast off produces a tight edge due to carrying one stitch horizontally across another stitch, pulling the stitch quite tight. This method is best for items that might stretch out with use, or for pieces you will later sew together because the final row will end up reinforcing the seam. Ease up on the tension while knitting to keep the cast off from getting too tight and distorting the shape of the finished piece. It takes some practice to avoid the cast off being too tight or too loose. Very similar to the knit cast off, the purl cast off is used when the final row of the project is purled, in order to give a smoother look to the finished piece. As with the knit cast off, watch the tension on the final row to avoid making it too tight. If you are working an item in ribbing, cast off in the same pattern as the ribbing. For single ribbing, knit one, purl one, slip the first stitch over to cast off one. For double ribbing, knit two, cast off one, then purl one, cast off one, purl one, cast off, keeping to the correct pattern across the row. Because ribbing is stretchier than either knitting or purling, this cast off method produces a looser finish than the standard knit or purl cast off. It also gives a nice lacy look to the finished edge. This is a perfect method for socks, where the knit cast off may make the cuff too tight to put on. It gives a smooth and flexible finish that will work on nearly every project. Knit the first two stitches together through the back of the loop, rather than the front. Then slip the new stitch back onto the left needle and knit two together through the back again. Slip the new stitch back. Continue to the end. This looks just like the standard knit cast off, but is much stretchier, since you haven't pulled any stitches over. You can do this method with purl stitches instead of knit stitches. Either variation gives an even squared-off finish to the project, rather than a tight pulled-in result.